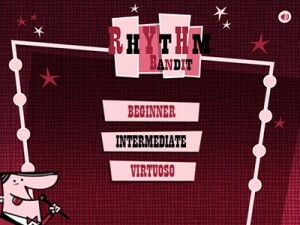 Rhythm Bandit Flash to HTML5 conversion, using Phaser. 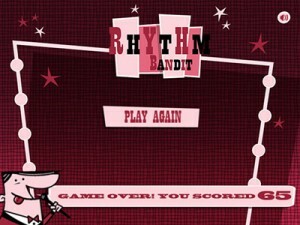 Now playable on ipad, iphone, Android devices and desktop. When the game starts you will have 1 minute (yes, one long minute!) to score as many points as possible. 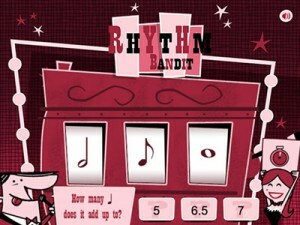 The Rhythm Bandit will spin its wheels and present you with 3 note values on the screen. All you need to do to gain precious points is to quickly answer the question. Please note – no treble clefs were harmed during the making of this game. This entry was posted in ANDROID, Android Games, EDUCATIONAL GAME, HTML5, HTML5 Games, iPad Games, iPhone Games, PHASER. Bookmark the permalink.